Whether you are a first-home buyer or about to renovate the new family home, there is a lot to be learnt from our wiser counterparts as they prepare for ‘The Downsize’. Moving into a smaller home can be a daunting task. For our Were Street clients Sally and Malcolm, ease and customisation were the must-haves at the core of a well-planned, researched and professional approach, six years in the making. 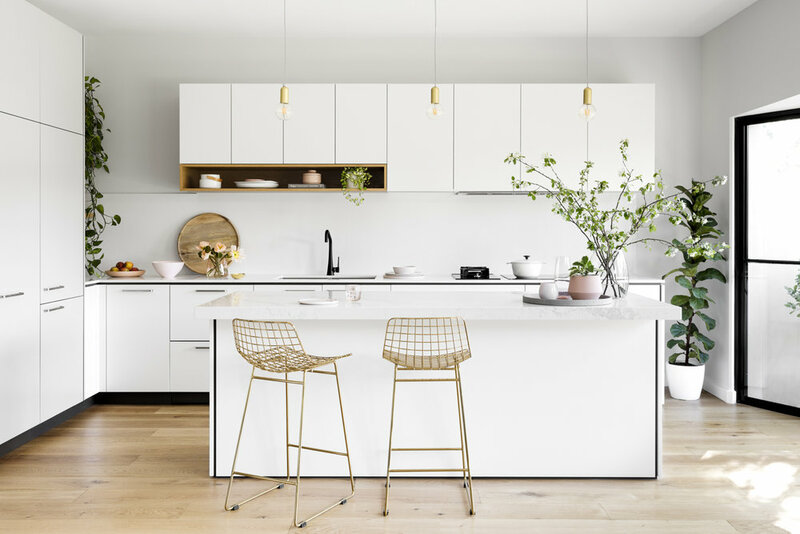 Home to (almost) empty nesters Sally and Malcolm, this elegant light filled ‘downsizer’ on the beachy side of Melbourne is the cultivation of six years planning, a love for scandi design, entertaining and home cooking. For this pragmatic pair, it was not just about consolidating financial security but also about ‘place-making’ - creating a space that is personal, in the right location, and which facilitates the shifts in lifestyle and wellbeing requirements that come with retirement. 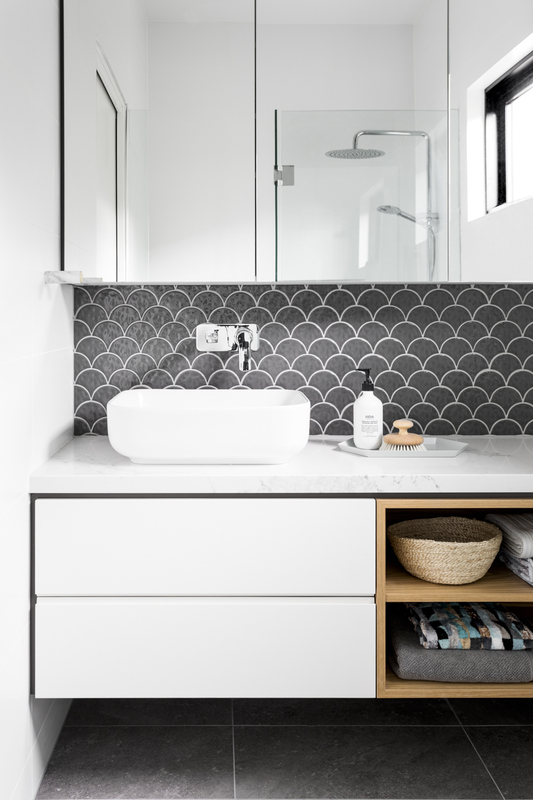 With joinery playing a vital role in the customising of their new home, we talk with Sally about the experience leading up to and working with Cantilever on their K2 kitchen, bathrooms and robes, with renovation works by our trusted friends at Sargant Construction. The palette for Were Street features two pack fronts in white and contrasting grey; oak veneer mitred boxes and open shelves; completed with crisp Caesarstone ‘Snow’ and marble-like ‘Statuario Nuvo’ with painterly grey veins. It was only a matter of time before Sally (an avid interiors enthusiast with a love for design blogs and magazines) discovered our kitchen range. Drawn to our K2 featured on The Design Files, she recalls her “that’s the one” moment, “that’s the style we want”. A ‘classic K2’ features contrasting finishes, clean lines and floating furniture elements like shelves and open boxes. This is then finished off with playful details: handless pulls and stainless steel handles; thick and thin benchtops. What perhaps goes unnoticed is a well-curated selection of appliances spanning eight brands (who says you can’t mix brands?). The combined ease of each thoughtful selection has made all the difference in creating a manageable social space (and unexpected party house): “We do a lot of entertaining: extended family, indoor/outdoor events, Christmas dinner, we have friends over a lot, and I even host afternoon drinks with colleagues quite often”. Seamless integration continues with a Fisher Paykel dishdrawer which provides segmented washing for “smaller loads during the week when it’s just us and fast turn over when we’re entertaining”. Our favourite mix is the ingenious gas and induction cook zone combo featuring easy care ceramic Smeg induction cooktop with an Akso Volcano Wok. Handpicked by Malcolm - a dedicated foodie - the myth that you need to choose between flame or new technology is evidently busted. Off to the corner, a black Armando Vicario nods in agreement, the lesson being: beat your own drum, stir to your own pot! Key to preparing for any renovation is investing time into the process, listing your needs, zoning in on the right home and working with professionals. Were Street offered an open plan with tall ceilings within a small footprint. A low-maintenance wraparound courtyard then doubles these areas into a multi-use indoor-outdoor living zone perfect for entertaining (and keeping a watchful eye on grandchildren). Built in the early 90s, the interior was due for an update but no major repair works were required. This kept the budget and focus on lifestyle rather than repair. When it came to their practical needs, the property had minimal steps, easy access and connected garage. By renting and living in the home first, their “try before you design” approach is a great way to refine a renovation brief: “It buys you the time to really think about what you want, what’s working, what’s not. From a practical perspective, it also offered a staged approach to some repairs that weren’t obvious at the beginning. We also reworked our initial ideas and decided to add the bathrooms to the scope as well. Why not?”. A floor to ceiling Walk in Robes adds valuable storage to the home. The Bathroom and en-suite soon joined the brief following on from the kitchen’s style. We love how Sally has carried through a richer grey through the home. Like Sally and Malcolm, it’s worth asking yourself, what do you want your life to look like? As designers and manufacturers, we spend a lot of time refining ergonomics and functionality. Designing for longevity is not just about good flows: beauty and personal elements are fundamental to our enjoyment of a space as well.